HP/Compaq AlphaServer ES45 is a powerhouse system for demanding enterprise applications. 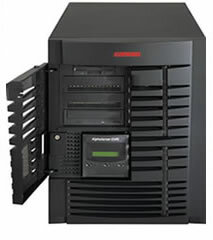 AlphaServer ES45 delivers large-system speed, power, and performance at a midrange server price. It is designed to handle the toughest business, technical and scientific applications with stunning speed. AlphaServer ES45 is ideal choice for crucial resource-intensive applications such as Oracle, SAP, and SAS in e-business, telecom and high performance technical computing. The AlphaServer ES45 Powered by up to four 1.25 GHz Alpha processors with increased memory bandwidth and now including hot-plug-ready PCI expansion slots. Reliability features include hot-swap RAID storage, advanced clustering support, and redundant hot-swap power and cooling.